Debbie here today with one of my favourite ideas for when I want to get a card done quickly but I just don't have the time to colour up a full image. It's also great when you are making lots of cards for an event or holiday. This technique has been around for a while but I hope this reminds you of what a fabulous option it can be...... it's the Spotlight Technique. Start by stamping or printing your image twice. Using the stitched oval cut out your full image and using the 2" stitched circle cut out the section you want to spotlight. If I have time I like to add a little bit of shading to the completed image, the amount I do depends on the time I have to get it finished. 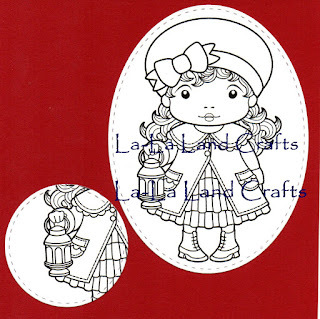 Another option is to stamp her onto a lightly patterned paper for interest. Colour up the smaller image completely. I like a thin border around my spotlit pieces so I tend to apply some coloured stickles to match my project. If pressed for drying time you can simply run a marker or gold paint pen around the edge for a quick border - although this is totally optional. Create a simple card and finish it off by popping the spotlit circle in place using 3D foam.